Most of the original arenas have been turned into surface lots, but Toronto's Maple Leaf Gardens managed an impressive rebirth. The National Hockey League's "original six" hold a special place in the hearts of fans. In a league that cherishes tradition, the half-dozen franchises that comprised the entire NHL until its 1967 expansion are held in particularly high regard, seen as the cultural and historic pillars of the league. With that image comes an equally significant aura to the grounds that once hosted them. Sadly, only two of these six arenas still stand, both in Canada. Montreal's Forum reopened soon after the Canadiens moved out in 1996 - gutted and transformed into a mall and entertainment complex known as the Pepsi Forum. But the newest and perhaps best arena preservation triumph can be found in Toronto, where Maple Leaf Gardens has come out of retirement. When the doors opened for the first time since 1999, the line of anxious locals stretched almost the entire block. Besides craving some good old-fashioned hockey nostalgia, the line was also for the opening of a flagship Loblaws (a local grocery store) as well as a beer and wine outlet and a clothing store on the upper level. For the hockey purist, and especially for the Maple Leaf fan uninterested in urban development, this could be a double edged sword. On the floor of Loblaws' aisle 25 rests a painted circle representing what was once center ice. 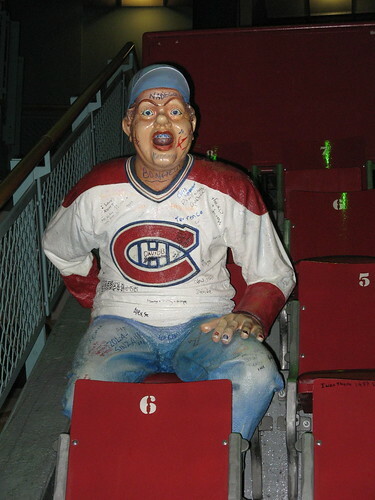 That historical tip-of-the-cap seems to be more respectful than the strange and now tagged fan sculptures inside the renovated Montreal Forum. But there are many significant nods to the arena's history. Structural columns throughout the grocery store depict famous musicians and the dates they performed in the Gardens. Blue seats were assembled along a wall to form a sculpture in the shape of a maple leaf. Tables contain assorted Gardens (mostly hockey) ephemera. The redevelopment is not done. The balance of the arena's space will become Ryerson University's athletic center. Part of that project includes a hockey rink and even some original seating from the building's NHL days. It is due to open this coming spring. BOSTON GARDENS 1928-1997, demolished. Last game: 1995. Currently: Parking lot. Author's note: As many readers have mentioned, the Bruins played in Boston Arena from 1924-1928. That venue still exists and is used by Northeastern University's hockey team. CHICAGO STADIUM 1929-1995, demolished. Last Game: 1995. Currently: Parking lot. DETROIT OLYMPIA 1927-1987, demolished. Last game: 1979. Currently: Demolished. Michigan National Guard Armory. MADISON SQUARE GARDEN III, demolished. Last Game: 1968. Currently: One Worldwide Plaza (49-story mixed-use tower). Back in Toronto, Maple Leaf fans who have long endured a painful rebuilding process, can seek more pleasant memories at a strangely familiar grocery store on Carlton Street. Unlike most aspects of being a hockey fan in Toronto, it's something other fan bases will likely be jealous of. All images courtesy Derek Flack of BlogTO.